A wedding photographer in Devon is particularly blessed with a range of fantastic venues ranging from the contemporary to the mediaeval manor house. One such venue is Dartington Hall near Totnes. On the website it says Dartington Hall ‘is not one thing, but a complex unity of activities’ and it’s very true. 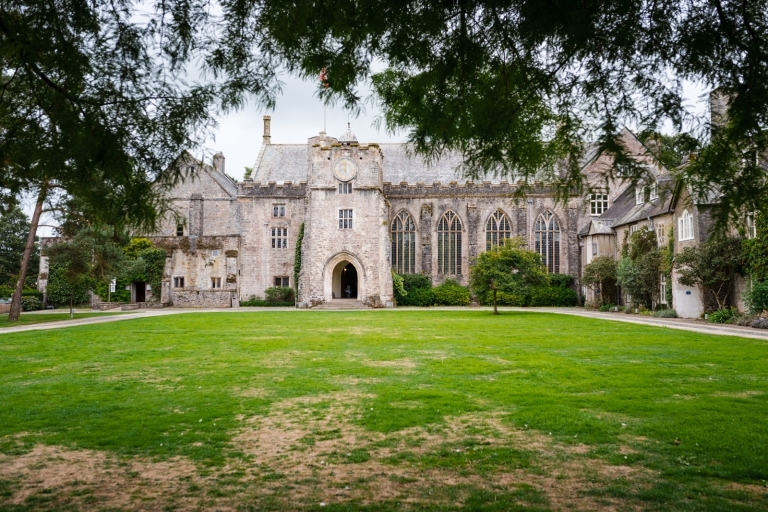 Dartington Hall hosts summer schools, arts festivals, social enterprise and, of course, weddings in the Great Hall which dates back to around the turn of the 14th / 15th century and which sits at the heart of a 1200 acre estate. So it was to Dartington that I came in early September for Rebekah and Jamie’s wedding. 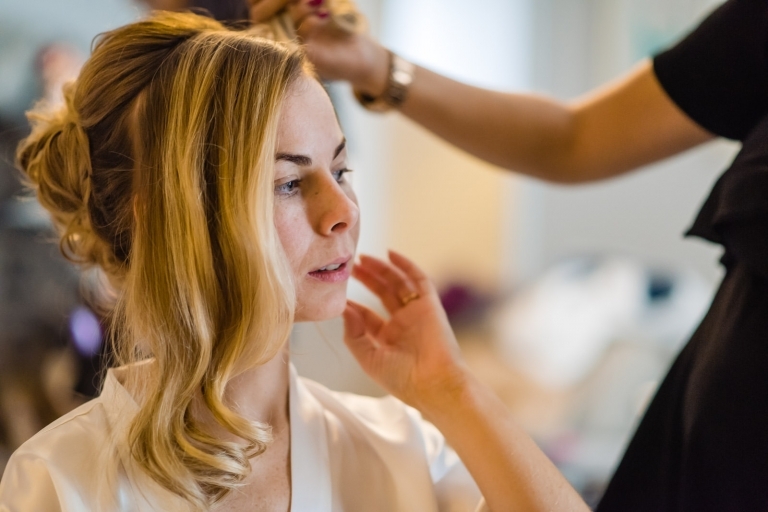 Rebekah and her bridesmaids and family were installed at the hall and getting ready there and Jamie was getting ready at home. We would all meet up at 1.30 at St Mary’s Church on the outskirts of the estate for the ceremony. I spent the morning with Rebekah and her sisters, mum and friends while she prepared herself for the day ahead. The usual high energy anticipation was in evidence when I arrived and the time seemed to fly by as the clock counted down. Despite an occasionally threatening sky the weather held and following the ceremony Rebekah, Jamie and their guests were able to take advantage of Dartington’s beautiful gardens. The gardens are quite something, filled with sculpture and little hidden away features and we took full advantage of them to grab a few pictures of the couple as they stole away from the crowds for ten minutes. For me it’s important during this part of the day to just let the couple be. It’s their chance to take five and reflect on the day so far. I don’t put any pressure on people during this time and it’s not something that I do with every couple – it all very much depends on whether they want to or not. You can see from the pictures I think that Rebekah and Jamie were totally relaxed and enjoying their escape from the excitement of the day before returning to the party and dancing the night away. Here’s a large pile of pictures from the day, probably too many pictures for a blog post but then I have so many favourites from the day that I can’t chose which to cut out. There are more I could add… Back in August I wrote about the need to ‘murder your darlings‘ when telling a story like the story of a wedding day. Obviously I’m not following my own advice here but then sometimes one has to make exceptions. I hope you like these pictures as much as I do. Please do persevere ’til the end, it’s worth it! If you’re getting married at Dartington Hall or anywhere else in the world then why not get in touch for a chat about having me as your photographer.